The tower that is located on the south side was built be-tween 1420-1567. It is one of the highest in Poland, measur-ing 101,21 m. The main builder of the tower was Peter Zehin. The tower has six floors, the lower parts arę four-sided, in the upper parts it changes into the octagon. In the 2nd half of the sixteenth century, the tower was topped with a copper dome. The dome of the tower is the work of the carpenter Georg Stellauf, the author of the crowning of Wrocław town hali. 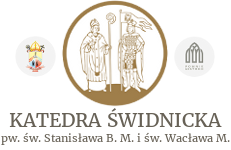 In 1566, Lorenz Schneider, coppersmith from Wrocław, covered the crowning of the tower with copper sheet. In 1567, the tower was fitted with a stone balustradę in the shape of octagon, and in 1574, the balustradę was decorated with eight stone statues: St. Peter, St. Wenceslaus, St. John the Evangełist, St. Lukę the Evangelist, Jesus blessing, St. Stanislaus of Szczepanów, St. Mark the Eyangelist and St. Matthew the Apostle. In 1565 gilded grate was added to the tower crowing. Fire that struck in 1532 damaged part of the church and most of the “interior decoration and fittings. 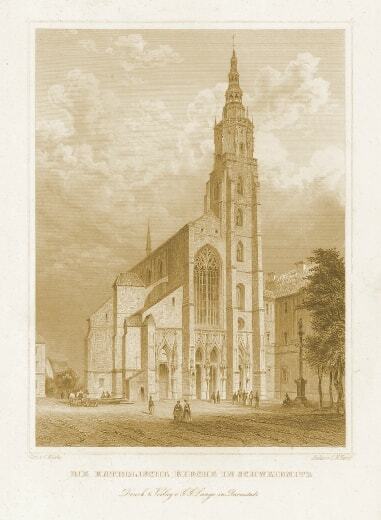 In 1660, the patronage of the church was taken over by the Jesuits who rebuilt the church, built over the large window of the nave and, in 1697, carried out the renovation works of the tower damaged during the Thirty Years’ War. At that time, the emblem of the Order “IHS” was placed on the weather-vane. In front of the church, the Jesuits placed the column of St. Florian (1684) and St. John of Nepomuk (1727). During the Silesian Wars, the church housed a camp for prisoners of war created by the Prussians, and then the flour storage in 1757-1772. On the sąuare before the church food magazine was built. In 1773, the church was restored asa place of worship.